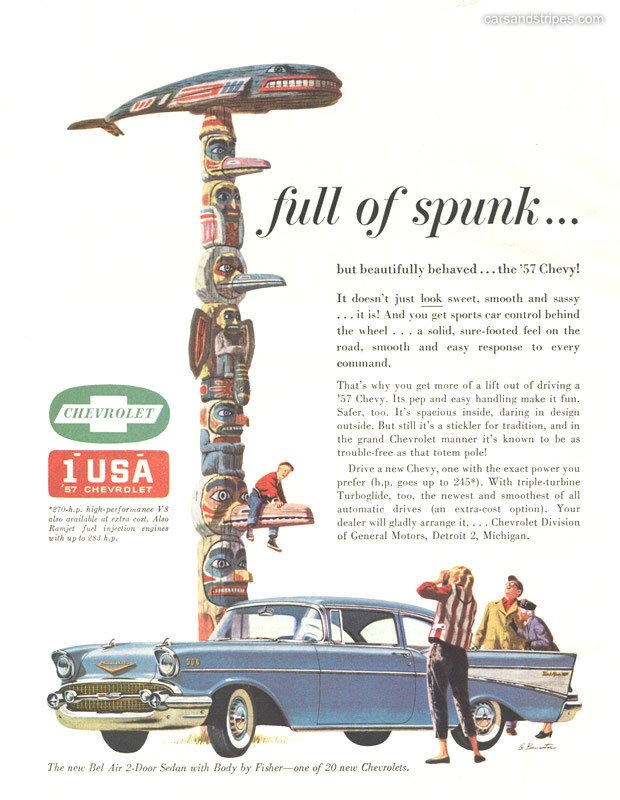 1957 saw a facelift, more horsepower and tailfins for the “Sweet, Smooth and Sassy” Chevrolet. Basically a 1956 model with extensive sheet metal reworking giving a lower, longer look. 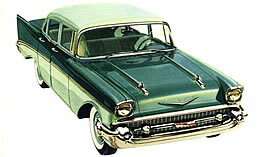 Once again the models were divided up into 3 classes; 150, 210 and the top of the line Bel Air. All sported the new oval shaped grill with bomb like extensions at either end. Normally flat faced these could be fitted with rubber tip extensions. A new transmission called “Turboglide” (paired with the V8 option) appeared later in the model year meaning that some earlier models still featured the “Powerglide” transmission. The Blue Flame 140 six cylinder was still available together with 7 other engine/power options. The 265 ci was still available but only for stick shift and overdrive options. The rest were the new 283 ci. 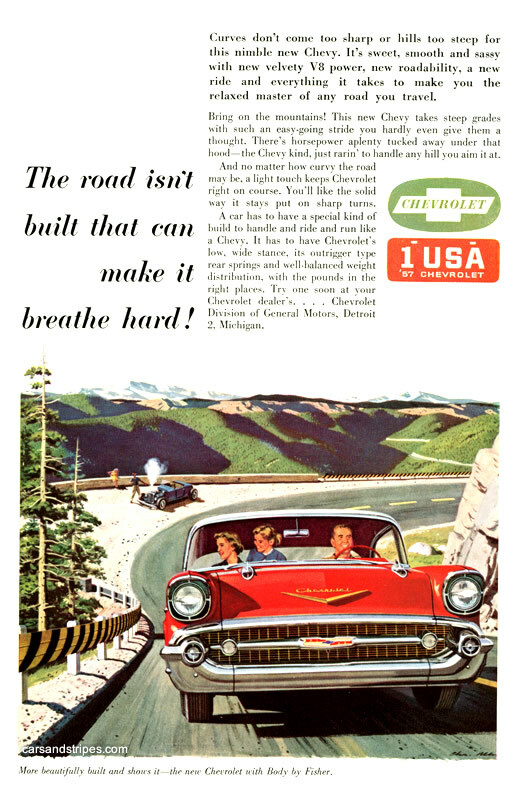 The top option sported 283 horse power and Chevrolet proudly announced this “one horse power per cubic inch” association. The 150 was the plainest of the range. It had side spears that where reminiscent of the 1956 210 series. Interior was fairly basic with rubber flooring. The new 210s now had a full length sweeping side spear that branched off towards the rear to form a second molding that followed the contour of the rear fender. The 210 was much closer to the Bel Air because of this feature but apart from some extra interior options there was little extra difference above the 150 base model. The Bel Airs sport a silver anodized aluminium panel between the side moldings. Chevrolet Bel Air crests are also present on the rear fenders. Additional trim also included bright rocker panel moldings and three gold chevrons were found on the front fender. Interiors of Bel Airs also had carpets and several more, distinctive vinyl and patterned cloth combinations.